As per my new schedule, I won’t always be posting on Fridays any longer–but when I do, it’ll be for a review of an indie work, or an interview with an indie author. Today I’m reviewing a great little story (or pair of stories) by fellow Indie J. M. Ney-Grimm: Star Drake. J. M. Ney-Grimm writes in a unique–or at least uncommon–genre: Nordic mythology. I’ve enjoyed Norse myths since I was a child, and although these stories don’t involve the familiar Germanic gods and themes, they have a similar feel. When you’re immersed in this world, you’re thinking of trolls, giants, hairy dwarves and buxom women. Okay, maybe not that last part–no Wagner here–but you get the idea. It’s a very particular brand of fantasy, but a refreshing one. Your main elements are present–magic, monsters, and heroism–but it’s somehow more down to earth. I’d say it’s almost “Tolkienesque” in that the stories feel like they’re happening on the Earth we know, but long before our recorded history. 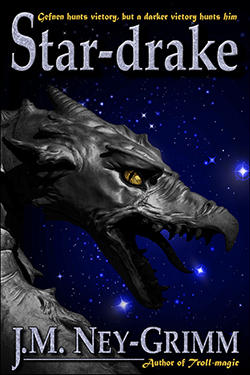 Star Drake features three stories woven together. Gefnen the troll warden searches for a meal for his master; Laidir the zephyr searches for his dear friend Geal, the rainbow; and the sea-lord Emrys and company protect a young boy. It seems complicated at first as the stories ebb and flow, and sometimes each thread only gets a few paragraph’s attention. But before you get twenty pages in, the threads begin to coalesce–or at least hint at doing so–and you see how they’re all inter-related. And this is where the magic of the story comes alive; this isn’t a case where you have a main plot and two subplots. Each thread is dependent upon the others, and they support each other nicely. To explain more would give away too much, so I’ll leave it at that. The thing that struck me most about this story was the tone. 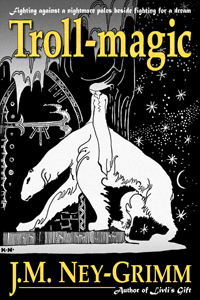 After having read another of Ney-Grimm’s stories, Troll Magic, I was expecting a fairy tale like story with a lighthearted feel. Not so for Star Drake: this one has a deep sense of importance to it, of destiny. It’s still written very much in a storyteller’s fashion, and you can easily imagine it being told around a campfire somewhere in the snows of the North, but it has a satisfying sort of weight to it. At the same time, it has a very dreamy feel to it. The style of writing is hard to describe–I’ve been trying to do so since I read it last week, and still can’t find the right words. The closest I can get is ephemeral. It has an extremely poetic cadence to it, and the words drift across the page like a layer of gauze draped over someone’s shoulder. You get the impression that, while the words are poetic and lilting, the tone belies extraordinarily high stakes. And that’s not to say that the stakes aren’t explored; there’s a good deal of action in the book’s 60 pages. The way Ney-Grimm’s characters use magic is certainly interesting, and a scene between Emrys and his friends fighting Gefnen is particularly satisfying. I’d like to have seen it explained a bit more, though; it seems to be elemental in nature, but it’s hinted that there are different levels of magic. I got the feeling that there was an underlying structure to it, but one that wasn’t shared with the reader. And this is the only real criticism I have for this story. 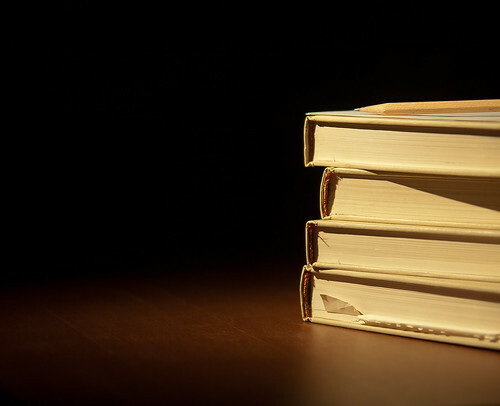 The world it’s set in is vibrant and unique, but it seems taken for granted that the reader will relate to it. I don’t know a lot of the mythology of the Nordic region, and while it’s similar enough to the Norse myths I’m familiar with that I can make educated guesses, it’s different enough that I was sometimes left wondering. Things like the relationship between Laidir and Geal are not explained, and I was confused at to who Gefnen’s master was, and why he was hunting at his command. I’m still unsure as to the significance of the titular creature. Ney-Grimm included a helpful guide to characters in her novel Troll Magic; something similar would be useful here. Fortunately, many of my questions were answered by the accompanying story, Rainbow’s Lodestone, which follows at the end of the book. I would actually recommend readers look at this story before Star Drake, as it helps set up that story, and serves as some excellent background. On the other hand, it does reveal certain plot points that could be considered spoilers for Star Drake, so I’m a bit on the fence as to which one should be read first. At the very least, I’d tell readers to read them both in one sitting, in whatever order. They compliment each other very well. Rainbow’s Lodestone concerns…well, I don’t want to give away the spoilers I mentioned, so I’ll just say it could almost be a prequel to Star Drake. It has a different tone entirely than the preceeding story, and it’s a testament to Ney-Grimm’s talent that she makes the transition so smoothly. This story is more lighthearted–much closer in tone to Troll’s Belt–and has an almost “childhood bed time story” feel to it. Despite the fact that it deals with a grim act of mischief, it’s a delightful read. This reminded me a bit more of the Germanic myths I know, so it was easier for me to relate to this story. The enchanting thing about it is the personification of the Rainbow, and the general attitude she has towards her fate in the story. There’s a nice underlying moral here. All in all, these are wonderful stories and definitely worth a read. Ney-Grimm’s unique blend of Nordic fantasy and fairy tale mentality is a refreshing take on the genre, and the poetic style of writing (whichever tone she uses) adds a special sheen to the work. I read a lot of fiction, and I can honestly say I’ve not come across anything quite like this. Fortunately, Ney-Grimm has a respectable body of work, so there’s more to explore! You can find Star Drake at Kobo and Amazon; if you’re interested in Rainbow’s Lodestone separately, it’s available in both stores as well. 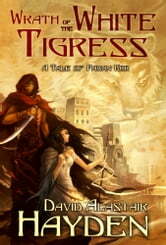 You can find the author J. M. Ney-Grimm at Goodreads and on twitter. Finally, if you’ve been following my blog you may remember a couple posts I did on cover design–much of what I learned there was thanks to a post of J. M. Ney-Grimm’s own blog.